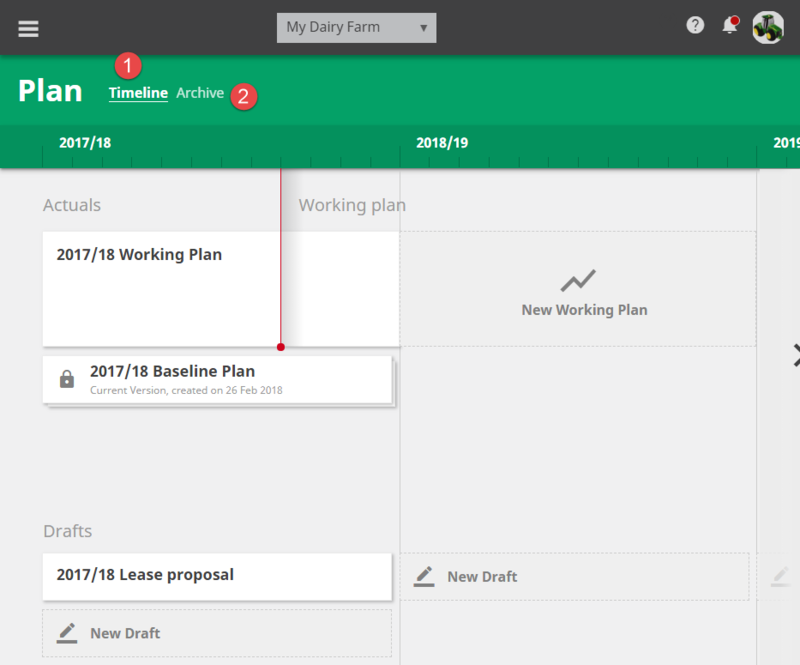 The Plan screen allows you to create, revise and organise your financial plans in one place. This area is where you will manage all financial plans for your farm business. There are three types of plans available each year, Working, Baseline and Draft. If you don’t want to delete certain Draft plans, i.e. you may want to use one down the track, you can archive them instead. This is the plan you’ll revise and re-forecast throughout the year, as actual and planned transactions combine to becoming a living plan. There is one Working Plan for each financial year and it is automatically created for you as each financial year begins. All you have to do is put in planned transactions. Want to know more? Click here to read more about the Working plan. Your baseline is the plan you have committed to and will probably give to your bank manager. Once you have moved a plan into Baseline it becomes read-only and the planned transactions within it can’t be modified. You can create create as many scenarios as you like for each financial year. If you want to, you can also promote a draft plan up to a Working plan.